Northeast Blackout, 2003. Photo by Brendan Loy. Source: Flickr Creative Commons. In the last post, I gave a general description of the national electric grid. In this post, I will describe how The Grid is organized. As we have seen in dramatic fashion several times, problems on The Grid can bring down wide areas of the whole network, plunging them into darkness and bringing life as we know it to an immediate halt. The first one of these blackouts was the famous 1965 blackout in New York. States affected included New Jersey, New York, Connecticut, Rhode Island, Massachusetts, New Hampshire, Vermont, and the Province of Ontario. Similar blackouts occurred in 1977 and 2003 (the largest of all). In response, the electric power industry formed an organization to study the problem and develop methods to prevent future occurrences. Over time, it developed into NERC, the North American Electric Reliability Corporation. NERC does not operate The Grid. Rather, it is a nonprofit membership organization tasked with ensuring the long-term reliability of The Grid. The companies that do operate The Grid are its members, and NERC sets the standards and operating practices they must follow in order to ensure the reliability of The Grid. NERC covers the contiguous 48 states, part of Alaska, Canada except for the far north, and a small portion of Baja California. It divides its territory into 8 regional regional entities. Until recently, membership in NERC or in one of the regional corporations was not mandatory. However, after the passage of the Energy Policy Act of 2005, NERC was designated as the only Electric Reliability Organization for the United States, and all power supplies and distributers who participate in the bulk power network were required to join. NERC develops national standards, the Federal Energy Regulatory Commission adopts them, and they are then handed back to NERC for enforcement. They are enforceable with fines up to $1 million per day. Figure 2. Source: North American Reliability Corporation 2017. I noted above that NERC is divided into 8 regional entities. They administer The Grid in their territory. NERC also divides itself into 21 reporting regions. This series of posts is headed toward reporting NERC’s 2017 Long-Term Reliability Assessment, so it is the assessment areas we are most interested in. 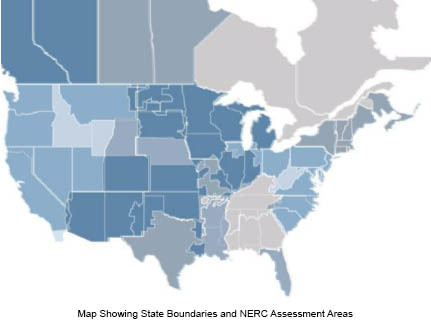 In Figure 2, I superimposed two NERC maps to show how the boundaries of the reporting regions align with state boundaries. In some cases they align well, in others, like Missouri, they don’t. In addition, some of the assessment regions have boundaries contiguous with NERC operating regions, others represent subdivisions of NERC operating regions, and still others have boundaries that follow the boundaries of Regional Transmission Organizations (discussed in the previous post). This is all very confusing, and one wonders what is going on. Don’t think of The Grid as something that always covered all of the country. It didn’t. The idea of transmitting electricity to consumers from remote generating stations was part of The Grid from very early on. However, electrification came to cities first. Rural areas were generally thought to be difficult to electrify because the large distances required high infrastructure costs that would be born by relatively few people. This was even more the case in difficult terrain such as the Ozarks and the Appalachians. These regions were among the last to electrify. Thus, The Grid is irregular. New electrical service areas expanded from existing service as a patchwork that followed routes of easiest access, not according to some overall plan of simplicity and symmetry. The flow of electricity through The Grid seems a bit chaotic and the boundaries of the NERC regions seem bizarre and arbitrary, but they have to do with how energy flowed into new regions from pre-existing service areas before The Grid was interconnected. Thus, the boundaries used to make assessments are not always those used to operate The Grid, and over time, both have changed. It’s enough to drive a person crazy! And yet The Grid is amazingly reliable, and NERC is tasked with keeping it that way. The next post will focus on major energy flows along The Grid. Anderson, Pamela, and Donald Kari. 2010. Is your organization prepared for complaince with NERC reliability standards? Perkins Coie. Viewed online 4/27/2018 at http://www.perkinscoie.com/is-your-organization-prepared-for-compliance-with-nerc-reliability-standards-02-18-2010. Loy, Brendan. 2003. 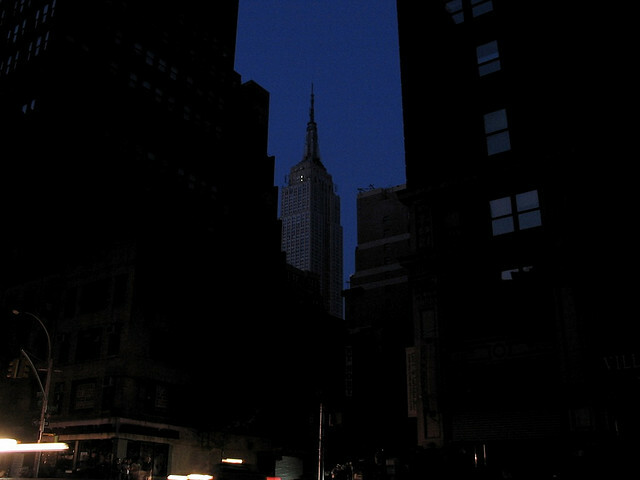 The Empire State Building in the Dark During the Great Northeast Blackout of 2003, IMG 6514. Source: Flickr Creative Commons. https://www.flickr.com/photos/brendanloy/2669855698. North American Electric Reliability Corporation. About NERC. http://www.nerc.com/AboutNERC/Pages/default.aspx. Nersesian, Roy. 2007. Energy for the 21st Century: A Comprehensive Guide to Conventional and Alternative Sources. Armonik, NY: M.E. Sharpe. Wikipedia. Adams Power Plant Transformer House. http://en.wikipedia.org/wiki/Adams_Power_Plant_Transformer_House. Wikipedia. Tennessee Valley Authority. http://en.wikipedia.org/wiki/Tennessee_Valley_Authority. By mogreenstats in Energy on 2018/05/17 .